The pictorial canvas painted by master Michelangelo Caravaggio is in Dublin, Ireland, and its exact copy, until the moment of sensational theft, was in Odessa, in Ukraine. The Bilean plot at the heart of the picture tells about the last day of the life of Jesus Christ on earth. It is known that Christ was betrayed by Judas – a faithful disciple of Christ, who pointed out to the guards the place where the Savior lived. It is known that the picture was written by Caravaggio – a supporter of late Mannerism – commissioned by Matthew Kyriaco. For many years the picture was considered unsuccessfully lost, but at the end of the twentieth century it was nevertheless recognized in one of the Societies of Jesus, in Ireland. The history of the movements of the painting is still very confusing; the case of the copy of the painting from the Western European and Oriental Museum of Art in Ukraine is known. For a long time, it was the “Odessa copy” that was considered the original or the original sketch. Until now, serious disputes have been going on about the origin of these two canvases; in no way can art historians reach a common opinion on this issue. 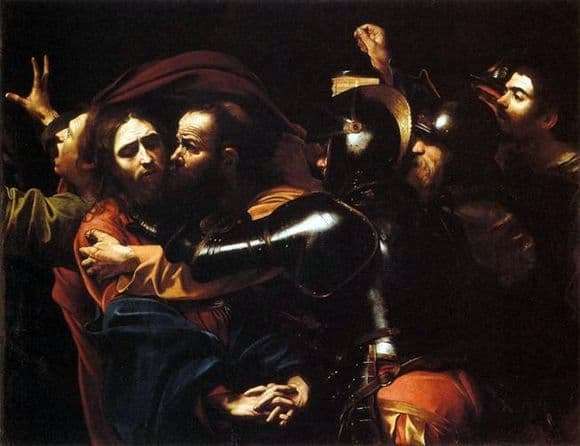 Most of Caravaggio’s paintings belong to the areas of realism and mannerism, and “The Kiss of Judas” is a canonical example for caravaggists, since this canvas has absorbed all the artist’s skill and mannerism. First of all, the negation of canonical Renaissance art is very noticeable – there are no static postures, facial expressions do not speak about inner experiences, do not use classical local colors, significant emphasis on chiaroscuro. Mannerism, in turn, is characterized by a harmonious, non-contradictory mental state of the portrayed and their external emotions, Caravaggio exposes the perception, makes the canvases sensual and full of emotions. “The Kiss of Judas” is primarily an emotional canvas that reveals the experiences of the heroes. On Iscariot’s face we see insane fanaticism, a grimace of suffering and servility, his hands firmly clinging to Jesus, he expresses his devotion through the betrayal that Jesus experiences, bowing his eyes, he knew that the betrayal will occur and only humility is visible on his face. Caravaggio makes a distinctive focus on the lighting inside the picture, as if the light rays fall from above.